The workshop challenged students to be more sensitive and thoughtful in their interactions with others, in order to be able to look at familiar problems with a fresh perspective. One group of students, for instance, discussed why so many of their peers struggle with procrastination. Although the discussion began with the students talking about the various distractions that make procrastination so tempting, it eventually evolved into an in-depth conversation about why people choose to procrastinate. One of the students suggested that people procrastinate from working on things that they care about, because they fear that they won’t do a good job. As a result, people choose to complete easier tasks, because the stakes aren’t as high and they feel less anxious about getting started. Although students struggled to come up with insights at first, many of them grew more comfortable with the process by the end of the workshop. After the workshop, there was a 41.7% increase in the number of people who reportedly felt confident about their ability to interview others in an empathetic manner. “It was insightful and useful in training us to think around the end user rather than ourselves,” student Adrian Wong shared with us after the session. 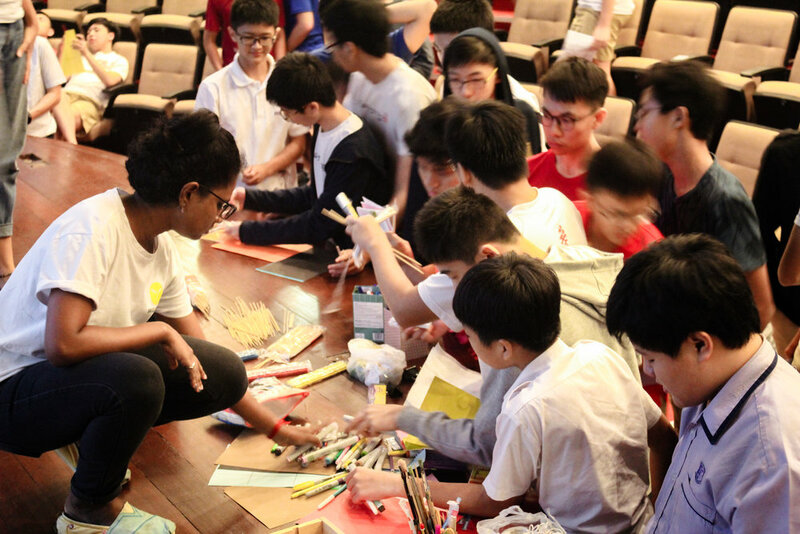 Beyond enhancing their sense of empathy, the workshop also showed the students that efficiency doesn’t always have to be the name of the game. The best solution to a problem doesn’t always require taking the shortest possible route. Rather, the best solutions are often a result of creative thinking and extensive brainstorming. Through creative primers like the circle game, where each person was challenged to transform 30 empty circles into different objects, the students learnt that creativity isn’t necessarily an innate trait, but a skill that can be honed through practice. We discovered that the students benefit from a space that encourages and supports ‘blue sky’ thinking - where clear-cut definitions of right and wrong don’t exist, where they have the freedom to think up the wildest, most innovative ideas, and where they have the opportunity to take ownership of them. During the workshop, students realized that their ability to create effective and sustainable solutions depended upon their ability to identify the root problem. As student Nathan Ng noted, “you have to understand your partner in order to [come up with] a solution.” The most valuable insights often emerged from thoughtful questions and empathetic conversation. For example, students gained a better understanding of the problem of academic stress when they learnt that many of their friends felt that obtaining academic success was the only way of gaining their parents’ approval. From this insight, they realised that the solution shouldn’t be geared towards reducing homework or abolishing exams (although these would go a long way in alleviating stress), but rather towards creating opportunities for honest communication between parents and children. It is easy to forget how hard to be a 15 or 16 year old, where the stress of school, extracurriculars and personal relationships can weigh very heavily on students. It’s also a time of self-discovery, where teenagers begin to formulate their own personal ideologies and beliefs about the world. In short, it’s a time where the stakes can seem very high because one’s self-worth can feel contingent on academic success and social acceptance. Not only do these young people feel pressure to succeed academically, but they may also be marginalized or isolated if their beliefs and opinions are seen as unconventional. It’s not surprising then, that more than 50% of the participants at each session opted to brainstorm solutions to school-related stressors, like a lack of work-play balance, and a lack of self-confidence. While these challenges may are difficult to manage, peers are an important component of any student’s support system. Indeed the encouragement and help that one receives from their friends and classmates can sometimes be more valuable than any form of top-down support. This is because a student’s peers have an innate understanding of these problems and stressors, simply because they go through these experiences together. They also spend lots of time together - up to 12 hours a day on a regular school day - which allows them to be the ‘first respondents’ for any problem that their friends might face. More importantly, many students have a deep desire and capacity to help their peers, a quality that we observed during the first session, when 38% of our survey respondents specifically mentioned that they wanted to learn more about empathy and how to help a friend in need. Students like Lucas Ang also shared that they wanted to “know how to make [their] idea easy and feasible for their friend to practise”. Friends, family, and teachers can be a great source of support during challenging times, but unfortunately, they aren’t always present or available to help. It can be difficult to find sustainable ways of coping with life’s stressors, especially when a person has to deal with them alone. One effective way is to formulate a solution that makes full use of a person’s strengths. The students at the workshop did a great job of leveraging their friends’ abilities, to come up with interesting and creative ways to boost each other’s confidence in school. One particularly creative student, for instance, came up with a simple solution to help boost his friend’s confidence, with just a set of flashcards. The student wrote a question on each side of the flashcard - on one side, a question about physics, a subject which his friend struggled with, and on the other side, a math question, which his friend would enjoy solving. Whenever his friend had trouble solving the physics question, he could simply turn the flashcard over, ace the math question, and get a little boost of confidence. This simple set of flashcards became an easy way for his friend to motivate himself through a difficult study session. He didn’t need someone else to give him a pep talk whenever he studied physics, instead, he had a way to boost his own confidence. Interested in learning more about Design Thinking for Social Impact and how to bring it to your school or organization? Check out more case studies on http://www.skillseed.sg/local/ or reach out to us at info@skillseed.sg for more information!